This first-of-its-kind study from a diverse international author group – led by Dr Christina Parker & A/Prof Jaap van Netten from the Queensland University of Technology – investigated the national diabetic foot guidelines of nations in the Western Pacific and compared them to the gold standard IWGDF guidelines. In short, they found many differences between recommendations made in the national guidelines when compared to the IWGDF guidelines. They also found these differences seemed to be linked with the methodology used to develop the guidelines and the level of complexity of care recommended. But as we always say is this the full story? What do we know about diabetic foot guidelines? Clinical guidelines are found across most areas of healthcare and have been found to be very valuable in helping clinicians care for their patients when they are used, including recommending best practice assessments, diagnoses and managements of a condition. The peak international diabetic foot guidelines have been developed by the IWGDF over many years. Their major focus has in fact been on the development and international promotion of guidelines for a global audience. The IWGDF recommend that properly implemented evidence-based guidelines should be the cornerstone of any nation’s attempt to reduce the burden of diabetic foot disease. Since 1999, the IWGDF have refined their methodology to develop their “guidance documents”, with their latest guidance documents or guidelines published in 2015. Their 2015 guidelines have 77 explicit recommendations across five key domains (chapters) of different areas of diabetic foot disease: prevention, footwear and offloading, PAD, infection and wound healing. Whilst the IWGDF have as its focus a global reach, and acknowledges that international guidelines may need local refinement and adjustment, there are still many, many different national diabetic foot guidelines published, including in Australia. Indeed, even within nations there are different guideline type documents that may be used within health services. However, to be evidence-based these guidelines need to be developed in a robust way and updated regularly to take into account new evidence. 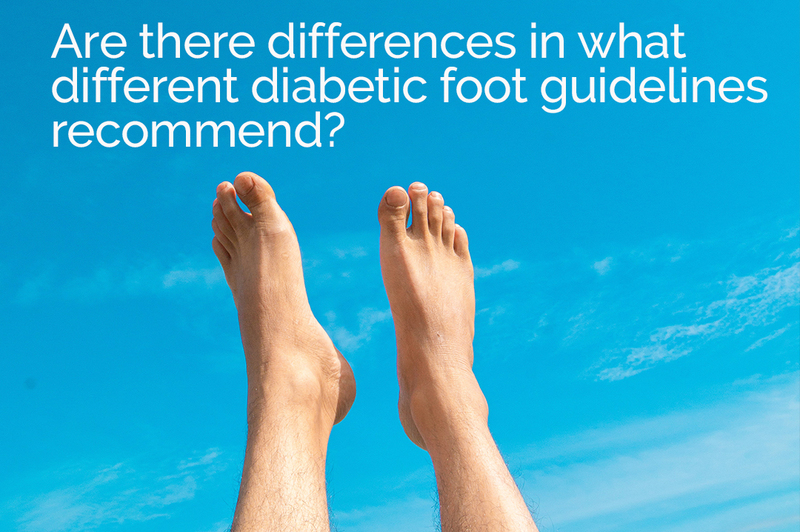 To date, no one had investigated to see what differences there were in diabetic foot guidelines, until this new study. This study invited all the national diabetic foot representatives from the 12 Western Pacific nations represented on the IWGDF to submit their national diabetic foot disease guidelines for comparison. The study firstly compared the methodology that was used to develop the nation’s guidelines, including when the guidelines were developed, the governance structure of the guidelines and how they went about it. The nation’s guidelines were then compared to the IWGDF guidance documents according to each of the 5 broad domains and the 77 individual IWGDF recommendations. These were compared to the IWGDF guidance documents by rating the national guidelines as “similar”, “partially similar”, “not similar” or “different” to each of the 77 IWGDF recommendations. This process was undertaken by two investigators, and any discrepancies between investigators were discussed with a panel of four investigators until a consensus was reached. Each national representative also checked the results. Eight of the 12 nations invited to submit their national guidelines responded. National guideline documents were received from Australia, China, New Zealand, Taiwan, Thailand and Singapore. Australia’s guidelines were the oldest (2011), with the others published between 2013 and 2015. The Philippines and Hong Kong advised they did not have formal national diabetic foot guidelines and the other four nations did not respond (Japan, South Korea, Indonesia and Cambodia). First, they found many differences in the methodology used to develop the guidelines. The governance structures established to write the guidelines ranged from members of a single discipline (such as Endocrinologists in China), to members from multiple disciplines and nations (such as national and international experts from eight different disciplines in Australia). The synthesis of the evidence for the guidelines – what the recommendations were based on – also differed and ranged from simply being based on experts opinions in Taiwan, to being based on systematic reviews and meta-analyses of the evidence in Australia and Thailand. The types of guideline document produced also ranged from a small section in a large diabetes guideline in China, to a large stand-alone diabetic foot guideline in Thailand. Second, the key findings were that only 39% of the national guidelines were similar or partially similar to the IWGDF guidance recommendations, 58% were not similar/not present and 2% different. The authors reported a trend where national guidelines with less robust methodology had less similarity (such as 13% in Taiwan) to those with more robust methodology had greater similarity (such as 52% in the NHRMC Australian guidelines). Third, the authors reported different levels of similarity with different IWGDF chapters, including 53% of the national guidelines were similar for prevention, 42% for wound healing, 40% for infection, 40% for PAD and 20% for offloading. Generally, the more complex the clinical recommendation, the fewer similarities with IWGDF guidance was found. This trend was also found within the IWGDF chapters, where the more complex concepts had fewer similarities, such as prophylactic orthopedic surgery for offloading or temperature monitoring for ulcer prevention. Last, the authors present very extensive supplementary information covering a detailed comparison of each of the 77 IWGDF recommendations with each nations recommendation which is very illustrative for particular recommendations and definitely worth a look if only for the sheer volume of work. For practicing clinicians, the use of guidelines can be easy in theory, hard in practice. Often there can be confusion as to what guidelines to use and when to take into account local contextual factors. This article presents new information on where the strengths and weaknesses of national diabetic foot guidelines for the first time and highlights that the way guidelines are developed is critical to how evidence-based the guidelines actually are, and further that appropriate governance and resourcing of national guidelines is also crucial to ensure that the best emerging evidence is captured and promoted. This study is very valuable in closely examining national guidelines that are representative of most nations around the world (with the Western Pacific making up around 30% of the world’s diabetes population) and how they compare to the very established, robust, gold standard international IWGDF guidance documents. The authors do however highlight some important limitations to the study. The rating scale used to extract data was not tested for reliability or validity. However, to combat this a consensus between at least 4 different authors was used and checked with the national representatives. The authors acknowledge that some guidelines may have been missed which might reduce the generalisability of findings. And lastly a major limitation was the authors’ only used very simple descriptive statistics which unfortunately only allows for simple descriptive interpretation and not more robust statistical testing of hypotheses. But, in this first-of-its-kind study this study has more upsides than down and provides some important new findings that should shape national guidelines for many years to come. This study highlights the challenges in interpreting which guidelines are quality guidelines to follow and which aren’t. It also shows how important it is that guidelines are developed in a robust way and updated regularly to accommodate new evidence. DFA strongly advocates the use of robust guidelines, as evidenced through numerous initiatives such as the Australia Diabetes-Related Foot Disease Strategy 2018-2022, 2018 Australia Guideline on Footwear for People with Diabetes and DFA’s own “DFA Guides you through” series. However, this study has also highlighted that the Australian diabetic foot guidelines are now in urgent need of updating. Or perhaps we should just borrow the IWGDF guidelines instead …. we say watch this space Australia 😉. Finally, the study has again shown how incredibly robust and valuable the gold standard IWGDF guidance documents actually are. And we are excited to say the new updated 2019 IWGDF guidelines will be launched at the 8th International Symposium on the Diabetic Foot in the Hague in May. Now if you don’t happen to be hanging around Holland in May, then we are even more excited to say we have no fewer than six of the key authors of these new 2019 IWGDF guideline chapters presenting the new IWGDF recommendations and much, much more at DFA 2019 in Brisbane in Sept. So as a famous Aussie use to (kind of) say, do yourself a favor Australia and get out and get yourself a DFA 2019 conference registration today.